Your dental implants should be placed by an oral and maxillofacial surgeon. Our oral and maxillofacial surgeon (OMS), Dr. Matthew Hilmi, has the advanced specialized education and training in the complexities of the bone, skin, muscles, and nerves involved, to ensure you get the best possible results in your dental implant case. Dr. Matthew Hilmi has been placing dental implants in Kingston, NY for nearly two decades; he has successfully treated thousands of implant cases during that period of time. Dental implants are a permanent and aesthetic solution to replace missing or extracted teeth. They are better than other alternatives like dental bridges because adjacent teeth do not need to be "prepared" to place the new tooth. The completed implant process is performed over the course of several months. The first part of the process is to insert the implant itself, where a "screw" is placed into the jaw bone. An incision is made in the gum tissue so that the implant can be placed securely. Several implants might be placed at once depending on your treatment plan. After the implants are placed the gums tissues are sutured (stitched). The implant must be allowed about three to six months to heal, and during this time the jaw bone will form around the implant in a process called osseointegration. During this healing time your dentist can place temporary crowns so that you can eat, speak, and confidently smile. After the implant has healed, it is time to place an abutment on the implant. The abutment serves as the base for your new tooth. Once this is placed, an impression is taken to help in the fabrication of your permanent restoration. Some of the general dental offices Dr. Hilmi works with have on-site technology that allows the restoration to be created rapidly. After fabrication, your crown will be permanently cemented. After a brief period of getting used to the implant(s) they will feel just like one of your natural teeth. A number of companies manufacturer dental implants. Dentists have many options for identifying the right treatment for specific patient needs. Our referring dentists are well versed in the use of most dental implant systems. Dental implants are categorized based on the type of surgery used to place them: two-stage or single stage. Two-Stage Implants: A two-stage procedure involves surgery to place the implant into the jaw bone and close (stitch) the gum tissue. Months after healing, a minor surgery is performed to afix an abutment and temporary crown or bridge. Endosteal (Endosseous) Implants: Placed in the jaw bone, endosteal impants are the most commonly used type for two-stage implant procedures. Placed as an alternative to a bridge or denture, endosteal implants include screw types (threaded) most commonly, cylinder types (smooth), or bladed types. 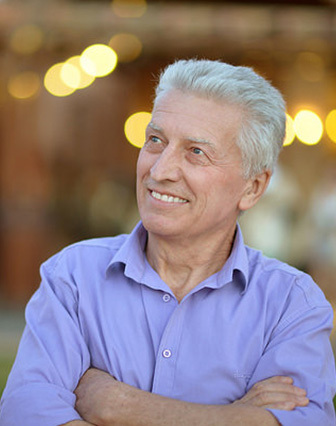 Single-Stage Dental Implants: A single-stage procedure involves surgically placing a longer implant into the jaw so it is on the jaw bone, level with the gum tissue. The gum tissue is then closed (sutured), leaving the implant head exposed. After several months of healing, the abutment and temporary restoration can be attached without the need for further surgery to expose the head. Subperiosteal Implants: Placed on the jaw bone within the gum tissue, with the metal implant post exposed to hold the restoration, subperiosteals are the most commonly used type for single-stage dental implant procedures. Subperiosteal implants are primarily used to hold dentures in place in patients with deficient bone height. Dental Implants look and feel like your own teeth. They are permanent and have excellent aesthetic appeal. Improved eating i.e. chewing. Dental implants are solidly affixed to your jawbone, allowing you to eat with confidence. Preservation of tooth structure. Compared to bridges nearby teeth don’t need to be altered. Dr. Matthew Hilmi and his staff are available to discuss dental implants as an option in your overall treatment plan. Our oral surgeon needs X-rays to help in the evaluation of your case. X-rays, panoramic X-rays, or a 3D CT scan (CBCT) will be used to evaluate anatomy and assess the condition of your bone and gum condition. We will need to take an impression of your mouth, which will help provide a model of your teeth, gums, and surrounding tissues. This will help Dr. Hilmi in his evaluation for your implants. If the tooth in question still exists, it will need to be removed. Often, the tooth extraction will be done at the same time as the implant placement. Dr. Hilmi will discuss, in-depth, the nature of your procedure and the choices of anesthetics to be used beforehand. After your tooth is extracted, the doctor will painlessly place a small cylindrical space in your jawbone-you will feel pressure. Occasionally the doctor may need to create an incision in your gum tissue to expose the bone, in which case a few stitches will be necessary to cover the dental implant. The implant will serve as the root for your new tooth. Depending on the clinical condition of your jaw, a bone graft may be necessary. This can be done with artificial bone materials and is usually a very simple procedure. **Expect to be at this appointment for approximately two hours. **Your diet and other postoperative instructions will be reviewed and details will be emphasized throughout the healing process. We are the experts in evaluating and treating patients seeking dental implants as part of an overall health care treatment plan. Feel free to contact us for advice on the dental implant services available through our practice.